The idea to create this monument came on the eve of the 1025th anniversary of the Baptism of Russia. PRAVMIR, July 10, 2014. 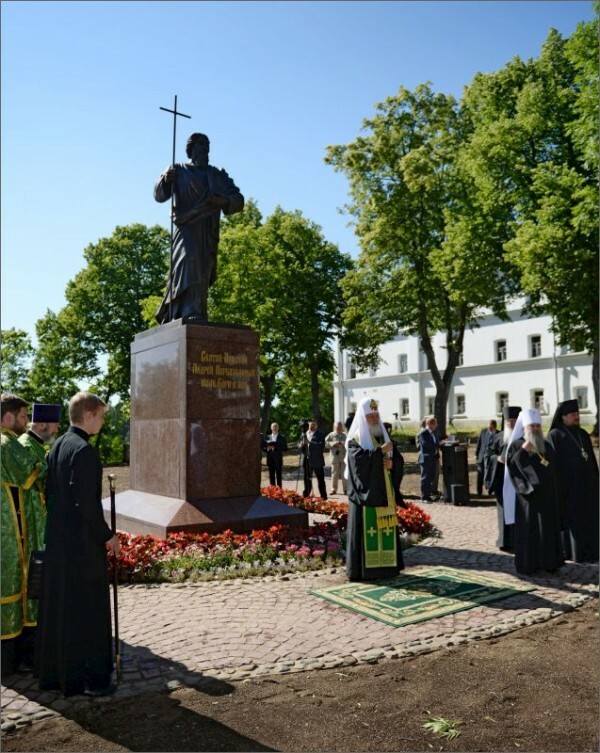 A monument to the Apostle Andrew the First-Called was ceremoniously unveiled in Valaam. The monument was consecrated by ​​Patriarch Kirill of Moscow and All Russia, who is currently on a pilgrimage to the Valaam archipelago, related Interfax-Religion. The idea for the monument came on the eve of the 1025th anniversary of the Baptism of Russia. The monument was created by the famous Russian sculptor, Andrei Klykov, in the workshop of the national artist of Russia, Vyacheslav Klykov. The monument was set on a marble pedestal at the entrance to the Valaam Monastery. The sculpture is completed in the form of St. Andrew’s cross: two intersecting lines. The sculpture is made of bronze. Its height is 3 meters 60 cm (4 meters with the pedestal).